In high school, Jonathan “Jon” Hughes, the eldest child of Les Hughes and Wendy Sorsoleil was active in about any sport imaginable – football, soccer, baseball, and swimming were his favorites. These days he’s taking on a different role on the team. He’s a coach. “I’ve always been outgoing. I like video games, food, sports, traveling, fishing, barbeques and jamming in the backyard with my friends,” said Hughes, 32. 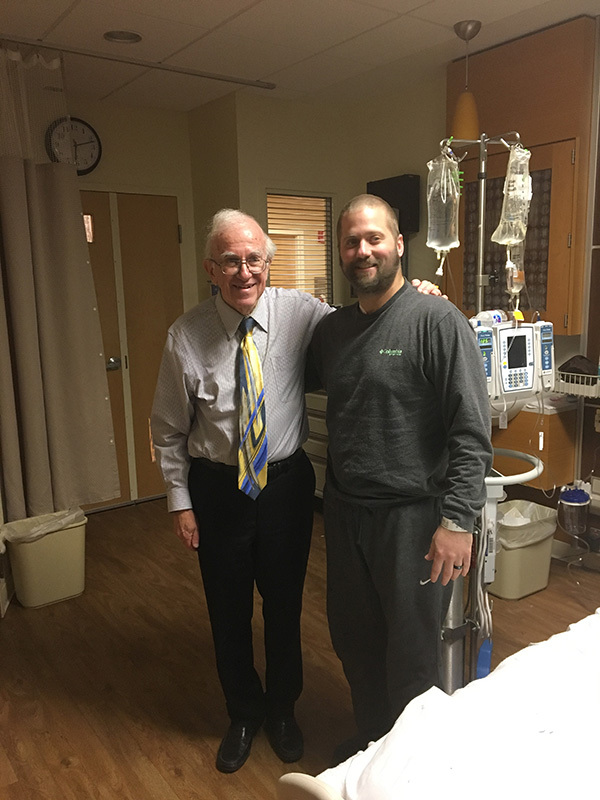 But when his home away from home became a hospital room in a cancer unit, Hughes turned his energy toward coaching other patients. “He lights up a room when he walks in,” said his dad. “He just wants to help others and be a friend.” He’s been in that role since October 27, 2016. He hadn’t felt well for over a year. Intense lower back pain led him to schedule an appointment to see his doctor back home in Sugar Land, TX. Tests revealed he had nonseminoma testicular cancer stage 3C mixed germ cell tumor. These types of germ cell tumors usually occur in men between their late teens and early 30s. Until the mid-1970s, only about 10 percent of men with metastatic testicular cancer survived. Dr. Lawrence Einhorn is known for successful treatment of germ cell tumors using a mix of high does chemotherapies and peripheral stem cell transplant. Hughes first tried this form of treatment at his hometown hospital but couldn’t complete the final round of chemo because of his falling platelets. The cancer continued to spread from his left testicle and lymph nodes forming a germ cell tumor that wrapped around the aorta and left kidney. Surgery followed. During the procedure to remove the tumor, he lost one of his kidneys. Hughes’ aunt – also a physician – knew of Dr. Einhorn’s treatment methods and that Tour de France champion cyclist Lance Armstrong was one of Einhorn’s patients. On November 4, following a round of chemo, Hughes married Jennifer – the woman he says is the love of his life, someone he has known since high school. Two months later, they left their jobs and came to Indianapolis. “When I came here I couldn’t walk, I was in a wheelchair, and my pain was at a level 12. The first thing the doctor said, was ‘it’s good to meet you. Now let’s get that pain under control.” said Hughes. 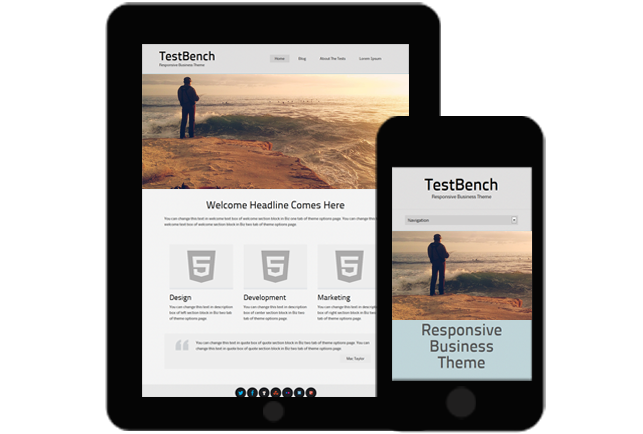 “That was my first clue that I was in the right place. The doctors have been straightforward and the whole team has been awesome. 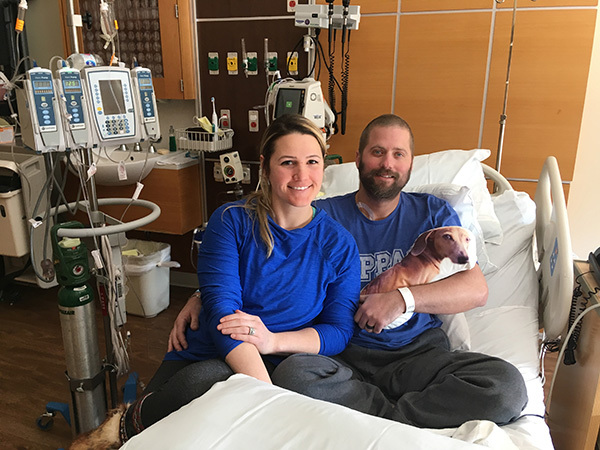 Aside from the staff, my wife and family are what are getting me through this.” The couple also had their dog, “Sweet Pea” shipped to Indianapolis for his extended hospital stay. Working with Dr. Einhorn and his team that includes Drs. Nabil Adra and Mohammad I. Abu Zaid, Hughes’ treatment plan consists of two rounds of high dose chemotherapy and a peripheral blood stem cell transplant – a treatment with high remission and recovery rates. At Simon Cancer Center, Jon makes his rounds walking the halls and chatting to other patients, offering support. It’s a routine he started at two other hospitals. 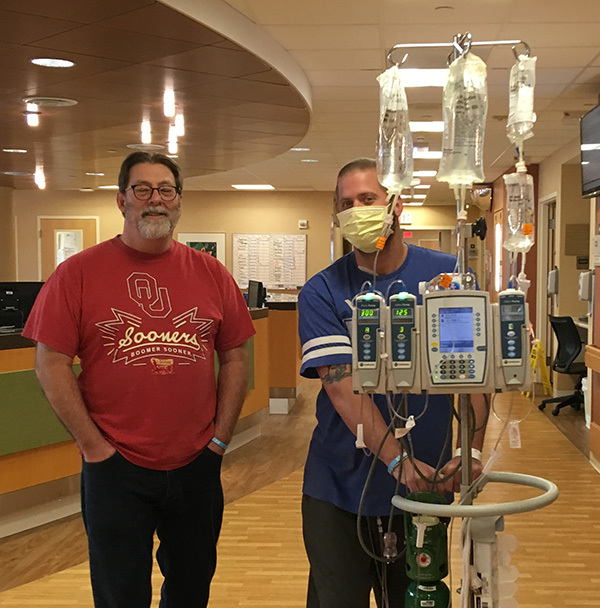 His friendships have been so strong that patients have attended his wedding and their family members have credited him with giving them hope. Next PostI’m pregnant! Now what?